Amid the euphoria of what been a quite remarkable season in terms of attendance, TV viewership, awareness and fan engagement, the A-League and its administrators must continue to make sound decisions, keeping its fans at the core. 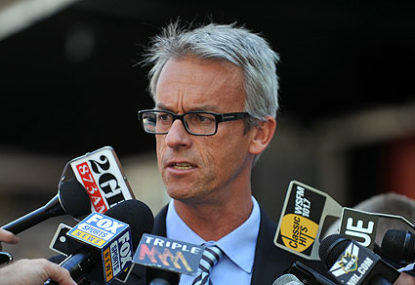 David Gallop says the league is currently in an execution phase, and there’s no doubt the success of the arrival or Alessandro Del Piero and the Western Sydney Wanderers has given the FFA a massive leg-up on the road to sustainability. But it’s a road likely to be full of obstacles, and Gallop and his team must continue to watch their speed and execute well. The five months between May and October this year will be critical, and the FFA will do well not to get too far ahead of itself. 12 months ago all the focus was on the issues surrounding the likes of Clive Palmer, Nathan Tinkler and quite a few more. Disgruntled stakeholders across club-land, struggling to see any light, were lining up to take pot shots at then-CEO Ben Buckley and his team. After the failed push into Queensland, the sense of distrust between head office and the game’s stakeholders could be felt across the country. Such was the tension after Gold Coast United were axed that Frank Lowy was moved to set up a joint A-League strategic committee (JALSC) to give club owners a greater voice and stake in the strategic direction of the game. It’s now history that the Wanderers were born out of the shipwreck that was Clive Palmer’s A-League toy, while the mining magnate moved on to start building a real-life Titanic. Neither the FFA nor Palmer will want their new toys to sink. Certainly, in order to capitalise on the success that has been the Wanderers’ inaugural season, the FFA will need to ensure it continues to look after the growing band of fans that have instantly identified with the club. It’s as engaged an audience as you will find anywhere, but it remains a young one, and the FFA should never take their engagement for granted. If they can learn anything from the history of their cross town rivals, Sydney FC, they should go back to the end of season one, where fans suffered due to the debt the club had racked up in the opening season, as well as the boardroom rumblings. Up went the ticket prices, in came a manager, in Terry Butcher, from a bygone era, and out went the bling, as well as much of the interest. It’s only this season, with Del Piero in town, and the Wanderers flying out west, that Sydney, the city, has rediscovered the A-League. But bubbling away under the surface remain a number of key issues that need to be given the appropriate due diligence ahead of next season. Primarily they come back to two key objectives, ensuring the sustainability of each competing club and finding the right balance on their relations with fans. Only yesterday there was another report from The Australian’s football scribe Ray Gatt about the Central Coast Mariners missing their fortnightly player and staff payments last week. Elsewhere, there remain a couple of issues between club owners and the tax office, as well as the need to find more investment at a number of clubs. On the fan engagement front, the FFA have come a long way since the feisty days of the fan-led forums, but there remains a level of distrust between the active support groups and the FFA’s security consultant, Hatamoto. The FFA has to find the right balance between giving fans enough rope to generate the wonderful active support that has turned heads and won hearts across the country, and ensuring this active support doesn’t spill over into anything sinister. Certainly, the experience that the league’s new head of operations, Russell Sargent, had in America with the MLS over the past decade should help on this front. It’s all a fine balancing act, but if the FFA had done anything right over the past 12 or so month, it has been to engage its fans and stakeholders, and, more importantly, listen. This is where the upcoming off-season remains crucial to the execution of its long term strategy. With free-to-air TV likely to expose the A-League to even more people next season, it’s important any lingering issues are confronted and addressed, and their ‘product’ showcases well. What the FFA can’t afford to do is turn a blind eye to any issue. Other codes across Australia are discovering this eventually catches up with you. Certainly the extra dollars from the new TV deal will help, but they must be invested wisely to ensure the game is in a position to capitalise in three or four years, at the point of the next TV deal. For example, on the field the FFA must continue to build upon the marquee impact of this season, constantly striving for improvement in playing and coaching standards. For all the outstanding success of season eight, this is a time for the FFA not to pat itself on the back, but to recognise the hard work has only just begun.